Freedom enjoys cooling off under the hose. Willow won’t let me spray her. We’ve had some hot, steamy weather here. Freedom stays cool by refusing to come out of the barn. He lives in a bank barn and it’s always cooler there. This is the time of year when I go through shavings by the bag full! 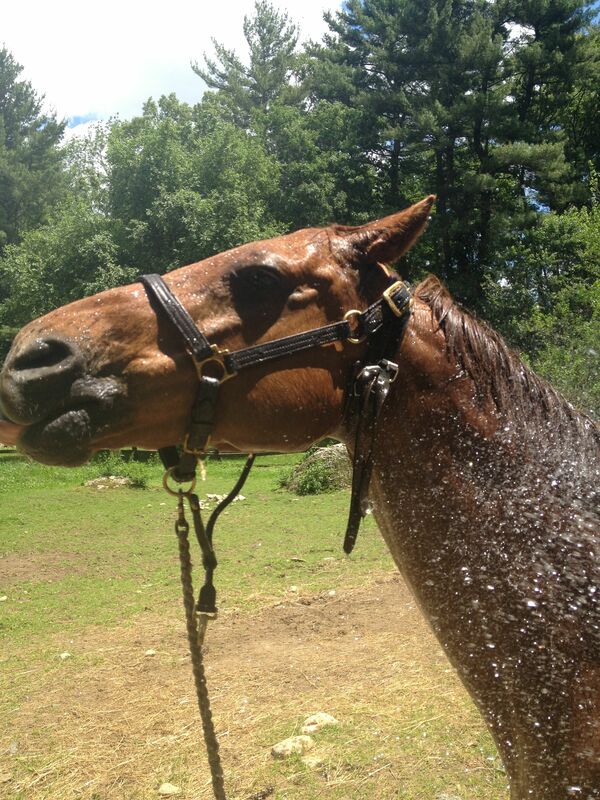 He does enjoy getting hosed off, but even then will only stand outside for a few minutes. I suspect that he and Willow come out at night when the temperatures have been more manageable. My dog, Woolly, has taken to lying down in the puddles while I ride. 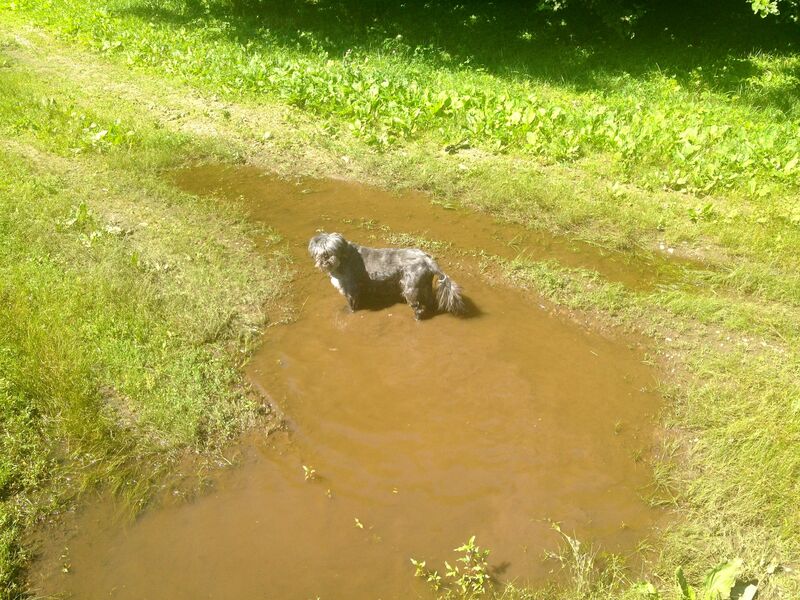 My dog has discovered the joys of puddles. 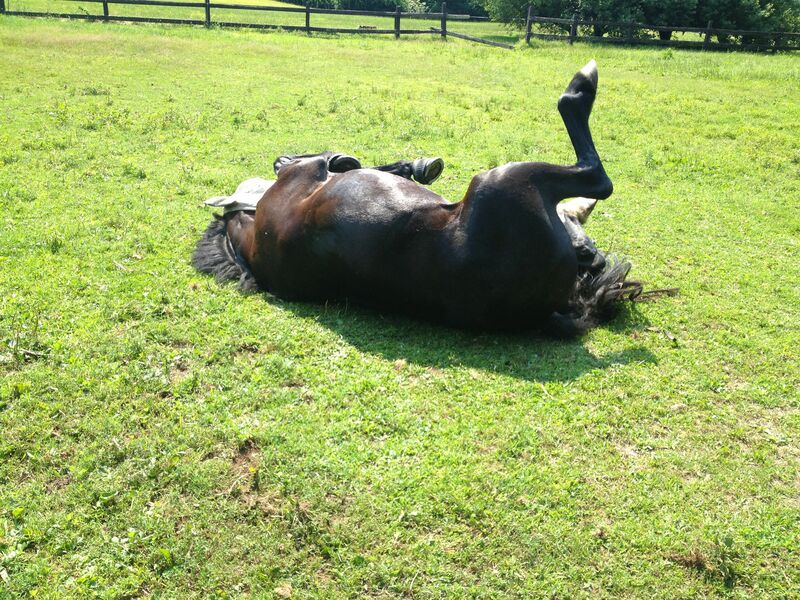 I often find him lying down in one (if it’s available) while he watches me do barn chores or ride in the field. 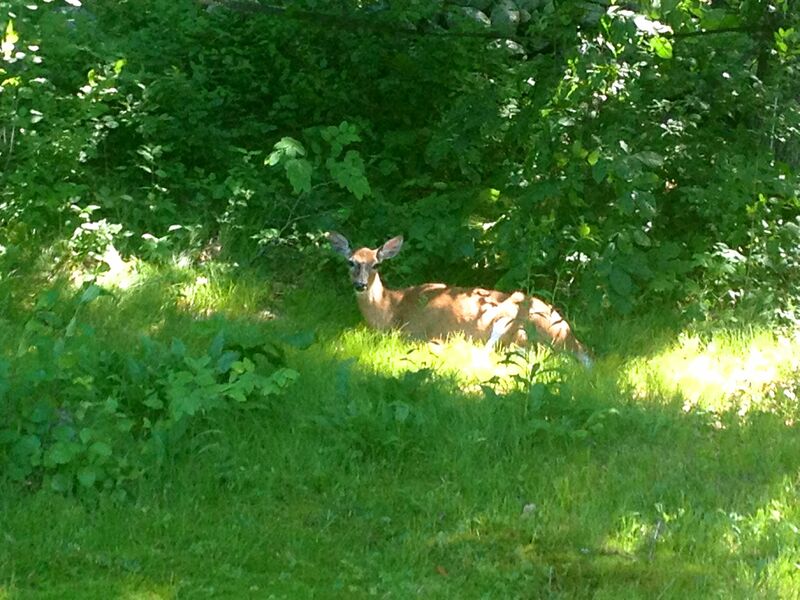 This doe watched me ride from the comfort of the shade. field. I don’t know if she thought I couldn’t see her, or if she is so used the horses that she didn’t care. Yesterday I spooked a doe and a very young fawn when I was riding home. The fawn bolted into the field with Willow and Freedom. It was tiny and spotted — only a few days old at most. The horses looked bemused and then it scampered off into the woods. Zelda really enjoys her roll after she works! About ten minutes later, while Zelda was luxuriating in her after-ride roll, I saw the doe come into the meadow, sniffing the ground and obviously looking for her baby. I panicked for a moment hoping that I hadn’t scared it too far off, but suddenly it burst from the woods all happy and excited to see its mother again.